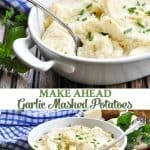 These Make Ahead Garlic Mashed Potatoes are truly the perfect side dish recipe! 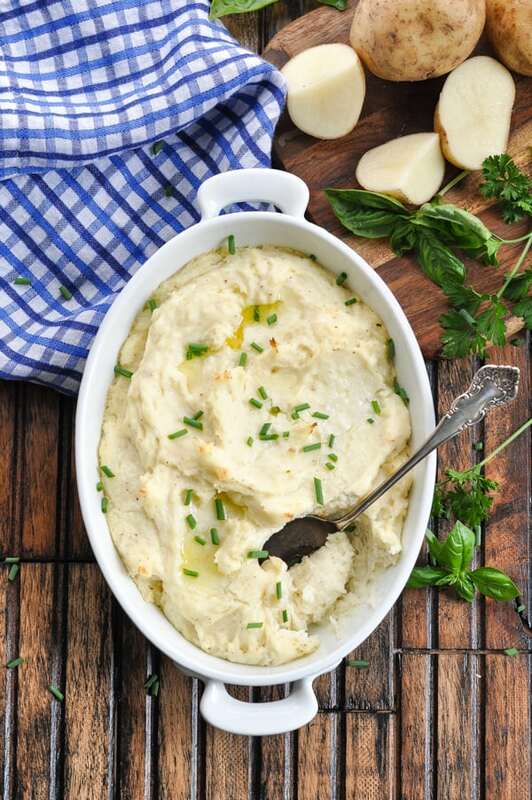 This Make Ahead Garlic Mashed Potatoes recipe is truly the best mashed potatoes recipe that you will EVER taste! 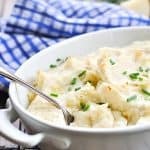 Made with sour cream, cream cheese, and plenty of zesty garlic flavor, the fluffy, creamy, and cheesy potatoes are an easy prep ahead side dish for any meal! 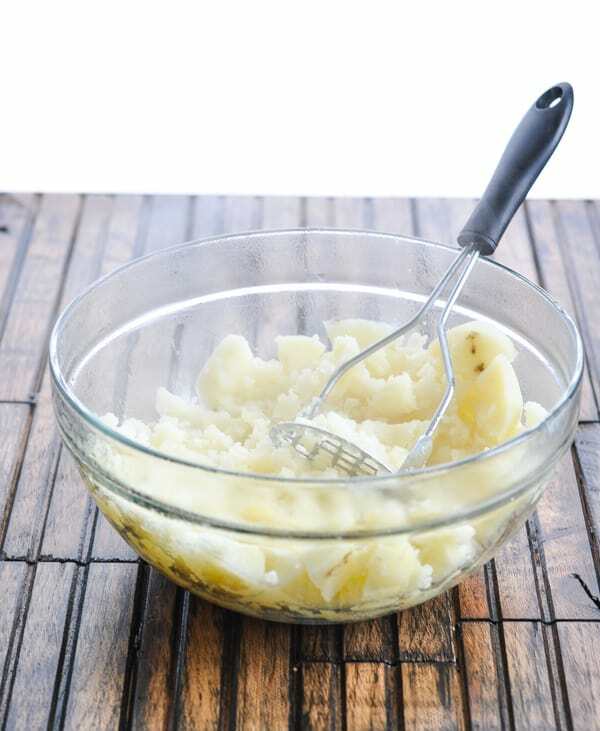 Every home cook should have an easy garlic mashed potatoes recipe in her back pocket! They’re a practical option that pairs nicely with almost any entrée, and even the pickiest little eaters love them! 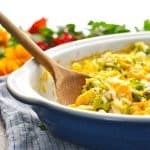 This make ahead option is particularly convenient for potlucks, entertaining, or big holiday meals when you don’t want to be stuck in the kitchen at the last minute. 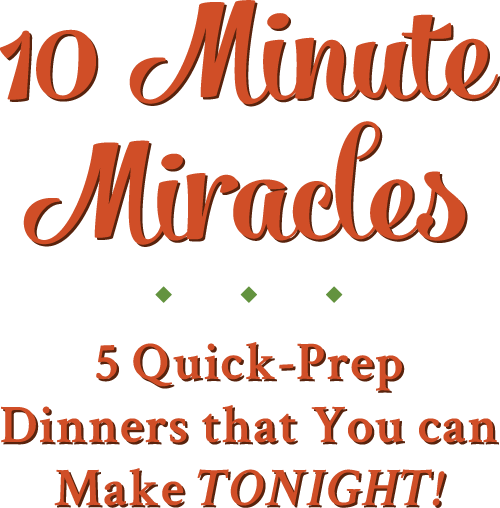 You can assemble them in advance and then just pop them in the oven about 30 minutes before you’re ready to serve them! 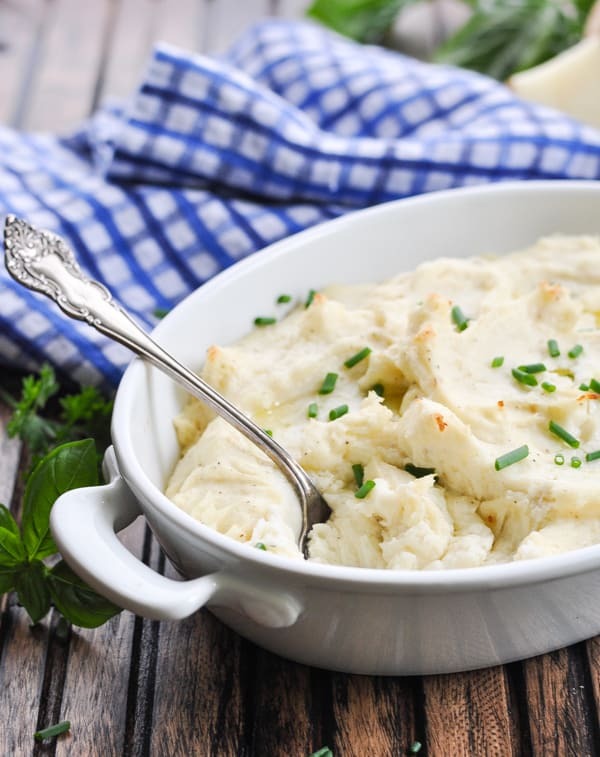 HOW DO YOU MAKE THE PERFECT CREAMY MASHED POTATOES? 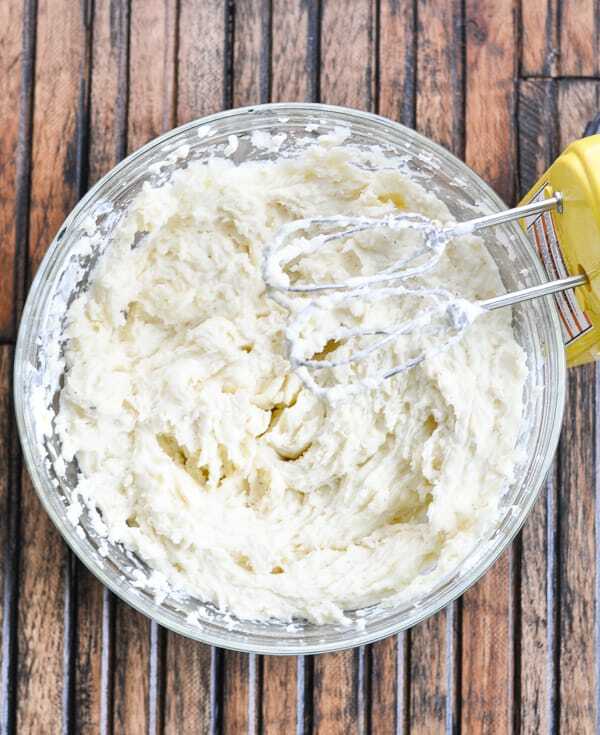 This simple recipe requires just a handful of basic ingredients: cream cheese, sour cream, butter, garlic powder, onion powder, salt, pepper and potatoes! You’ll start by peeling and chopping the potatoes into quarters. Making them smaller helps them to boil faster and makes mashing them very easy. 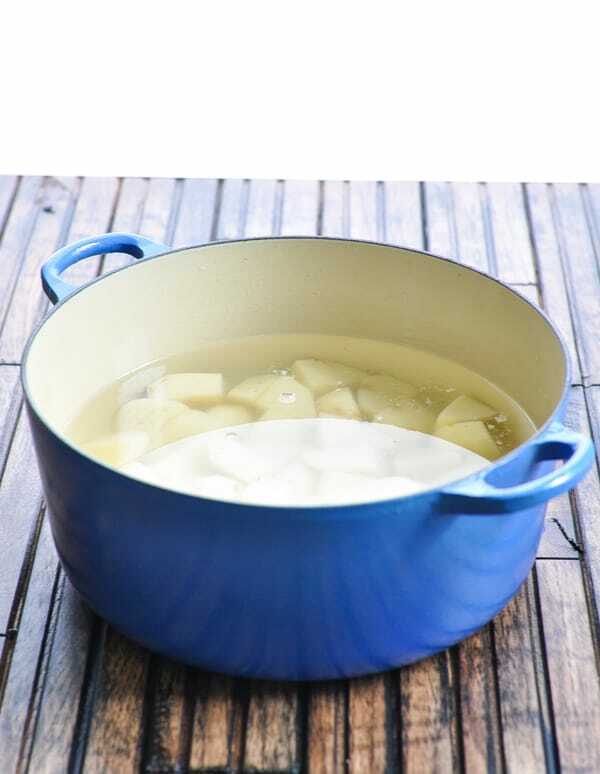 Place the potatoes in a big pot and cover with warm water. Boil the potatoes for about 30 minutes, drain them, and mash them with a potato masher. Add the cream cheese, sour cream, garlic powder, onion powder, salt and pepper. Beat with a mixer until light and fluffy. At this point, you can either serve the mashed potatoes right away OR you can transfer the potatoes to a baking dish and refrigerate for a couple of days. I’ve shared the easy re-heating directions in the instructions below. 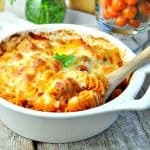 Gotta love a make-ahead side dish! I used white potatoes here, but you can also use russet potatoes or Yukon Gold potatoes. 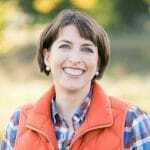 Red potatoes will work, but they’re not my top choice because they tend to yield a less-creamy dish. 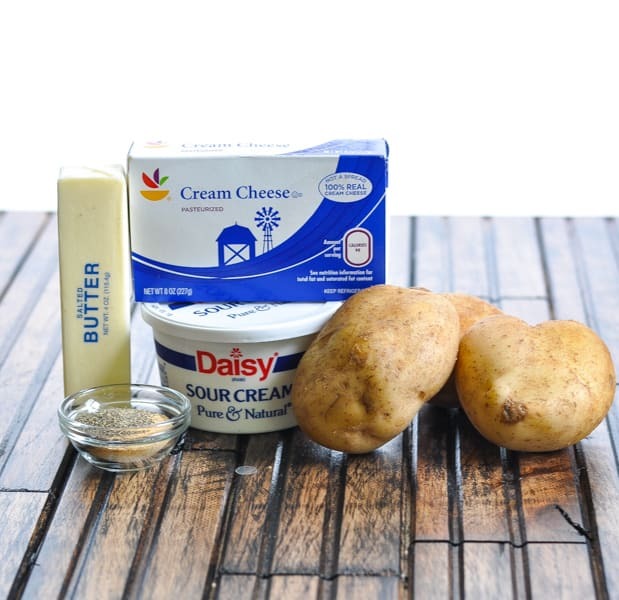 Make sure that your cream cheese and sour cream are at room temperature before you mix them into the potatoes. 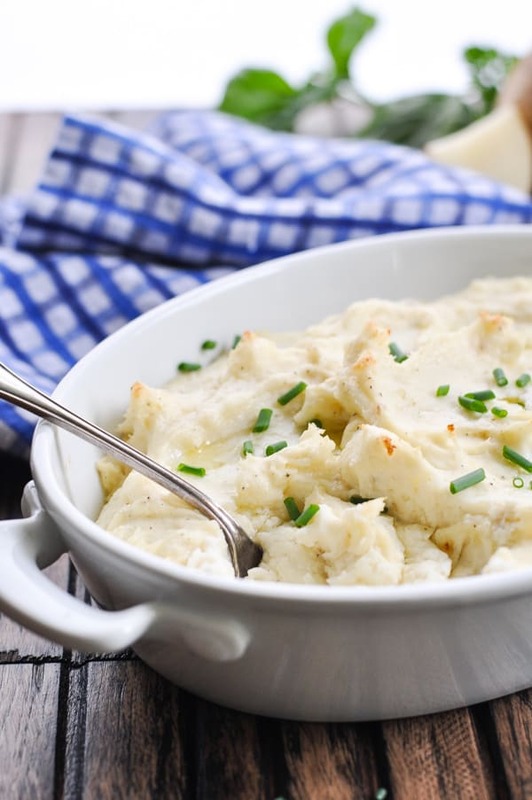 Use chive cream cheese for extra flavor in the mashed potatoes! Garnish with chopped fresh chives, green onions, or parsley for a bright, fresh finish to the dish! These garlic mashed potatoes with sour cream and cream cheese are perfect with just about any main dish. Peel and quarter potatoes. Cover with warm water and boil until tender (about 30 minutes). Drain. Mash. Add cream cheese, sour cream, garlic powder, onion powder, salt and pepper. Beat until light and fluffy. 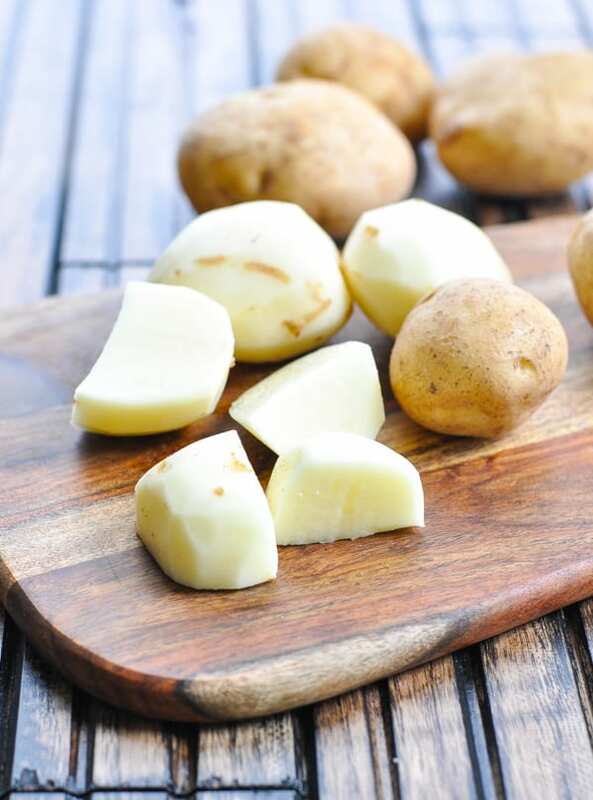 Serve immediately or transfer potatoes to a baking dish that has been sprayed with cooking spray. 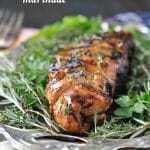 Cover and refrigerate for up to 48 hours. To reheat: dot with butter and bake, uncovered for 30-45 minutes at 350 degrees F (or until heated through). 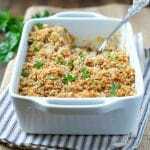 I used white potatoes for this recipe, but you can also use russet potatoes or Yukon Gold potatoes. Red potatoes will work, but they're not my top choice because they tend to yield a less-creamy dish.